How Trulia App Clone Will Redefine The Luxury Real Estate Market With These Amazing Features? The real estate industry has developed significantly in the past few years. The drastic change can be attributed to the sudden penetration of the mobile in this niche. Few years back, searching for a property was one of the most difficult things. You would never know what properties existed in a particular area. The story behind Trulia is somewhat similar. When the founders, Pete Flint and Sami Inkinen, were unable to find a good accommodation owing to the expired listings on the various property websites, and no proper maintenance of these sites and applications, they decided to develop the real estate app Trulia. With Trulia, they were able to offer better and easy access to the various property listings across a particular city or country. The app has been acquired by Zillow. You may ask why Trulia’s existence has created a difference in the real estate niche. » Firstly, it managed to solve the biggest headache of the people hunting for homes. It offered cheaper and better options on their mobile screens. They did not have to move out of their places to find good accommodation. » Secondly, they keep updating the property listings and make sure there are no old inexistent listings on the board. The main success of the app can be attributed to the fact that they played along not just a niche industry, but also a niche market. This helped them build a sound audience for their purpose, and win the majority market. If you are planning to develop an app like Zillow, there are a few things that you might want to consider, and a few features that you simply cannot neglect adding to the app. Here we will discuss both the things in order to make the app development easier and faster for you. So, shall we start with the features that you should add? » The database: This is the first and most important feature, without which you simply cannot think of developing a real estate app. It is not really a visible feature of the app; however, it is the perfect backend support for all the frontend features that you will devise in the application. Your list of properties sorted by the country, city and region is an important consideration when developing a real estate app. For Trulia, the database came from the data available with the National Association of Realtors and Multiple Listing Services. You will need to find out the companies or associations that can provide you with the listing of the properties in your region or country to prepare the base for your app. The other means of getting your database ready would be properties put out for sale by the owners and the properties put out for sale by the 3rd party owners. You can even use the APIs offered by Zillow and Trulia in case you want to access the database of the regions these apps work in. » Register New User: The second most important feature for an app like Trulia is the registration or sign-up for the new user. You should ideally make it easy and experiential for the users. The on-boarding is the part that will help the user get to know you better and make an impression about you. the idea behind offering a sign-up feature is to make the users get to know the app better, help them understand the features and personalize the listings according to their preferences. The profile created will help the app to know the users better and consider offering them suggestions and solutions accordingly. » Search & Advanced Search: If the user wants to sort the listings according to their preferences or wants to find a particular property in the specific area, will your app be able to offer them that facility. With filters and search feature, you can make it easier for the user to identify a property according to their preferences. The search feature that you will install in the app should be finely defined, making sure you know how important searching for a good property is for the end user. You can use the factors such as the number of bedrooms, locality, property type, area, year built, square foot, amenities etc. to narrow down the search of the property and improve the user’s experience. The end motive is to make the search identifiable and relevant for the users. » The navigation: An app like Trulia has gained popularity not just because of the listings, but also because of the way it has used the map. The map allows you to check a variety of things about the area that you might be considering, giving you enough food for thought. For instance, you get the crime rates in that area, the number of schools present and their ratings, the nearby shops & eateries, population and traffic statistics, as well as the reviews of the locals regarding that area. If you are in another city or region, these statistics help you know if you are willing to book a place for rent in that particular area. The app has tapped into various databases and APIs to get this information that you are looking for. » Accommodation Details: Apart from the locality details, the users also need to know the details of the flat or apartment or in general the accommodation they are either planning to buy or rent out. This app should contain all the possible details about the accommodation right from the number of rooms to the price, address, the amenities, year built, sold by owner or agent etc. along with the list of these details, the app should also offer a list of the other apartments or flats that appear to be similar to the selection made by the user. Apps like Trulia also offer users with mortgage calculators that make their lives easier. » Personalized notifications: The final feature that you ought to consider before getting started is the push notification. You need to make it personalized and relevant to the searches made by the user. The push notifications will help the users visit your application on a regular basis and engage them better. Notifications that alert the users about the rise or drop in the prices of the particular apartment, one that they have been looking at, might interest the user. Also read: Why You Should Invest In Developing Apps Like Zillow or Trulia For The Canada Real Estate? When you are developing a real estate app, you need to think through the various situations, the end user and factor in a lot of things. Here we will talk about the main things you might want to consider when developing a real estate app. » The purpose of the application: Why do you want to build a real-estate application? Is it because there are none available in the market or, the ones available have some gaps? What is the definition of the real estate app you are developing? The purpose of the application will define the process for development and the inherent features. » Google places API for information on the surrounding spaces such as stores, cafeterias, spas, groceries etc. » The cost of development: Based on the features, the market you want to include, the database and other considerations, such as the tech stack as well as the API integration, you will be able to add up the cost of developing the real estate app like Trulia. You will need to make sure you have considered all the points before making the final cost evaluation sheet. While you are in the planning phase of the real estate application for your business, make sure you have identified the monetization model for the application, as well as the marketing approach you are planning to take. This will help you accelerate the launch and increase the audience intake for the application. The popularity of the application depends on what you offer, how you offer and when you offer it to the audience. 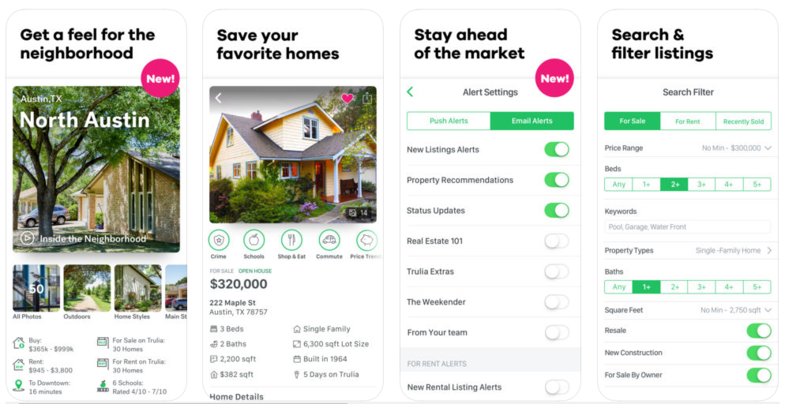 If you are planning a Trulia app clone for your business for a niche market, then connect with us at Coruscate. We will identify the custom features that will help you rate your app better, and increase your downloads and conversions.